The new Dungeons & Dragons Starter Set is the most unique and engaging way to introduce someone to a roleplaying game I think I’ve ever seen. OK. Let’s back up for a second. 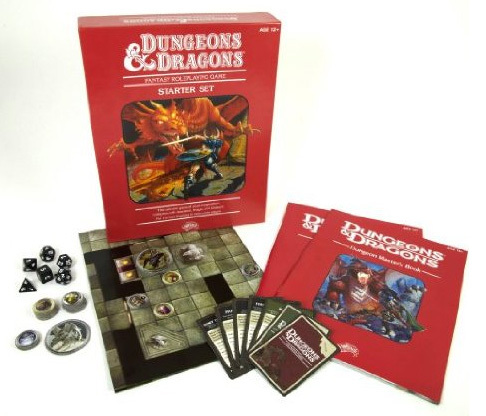 The new Starter Set was designed to mimic the appearance — and to an extent, the purpose — of the 1983 D&D set. The ‘83 set was designed to contain all of the Basic D&D rules in one location, and unless you wanted to buy another adventure, you were good to go. But that was a more innocent time. These days there are decades of rules. Countless races, more monsters than would even fit in three books, entire worlds, and dozens of adventures ranging from slim booklets to hardbound campaigns. The Player’s Handbook could easily be the size of a phone book, with players howling over all the important rules that didn’t make the cut. So, one might ask, what could Wizards of the Coast possibly put in the new Red Box that could meaningfully prepare someone for playing D&D? The idea that Wizards of the Coast could cram a relevant portion of the rules into a boxed set is absurd. Instead of serving as a rulebook, the D&D Starter Set has a different purpose — to lure n00bs into becoming D&D fans. The set consists of two booklets, one for players and one for Dungeon Masters, as well as dice, character sheets, power cards, a battle map and character tokens. The player’s book downright fascinates me. You remember the classic Choose Your Own Adventure books? Well, that’s what the player’s book is. Give the book to a n00b and he or she can self-direct through a simple adventure and learn the basic terms and rules. The DM’s book presents like a more traditional basic rulebook. It begins where the player’s book leaves off — OK, you basically like what you’re seeing, now what? The DM’s book guides the reader through game terminology, gives gamemastering tips, and includes adventures, monster listings and other classic staples. The group can make a small number of archetypal characters, and battle a small number of archetypal monsters. Best of all, a group of neophytes can get a handle on the game without a huge investment in time. Nor of money — the suggested retail is a non-allowance-busting $19.99 ($13.59 on Amazon!) so it really isn’t a major gamble for kids to buy. Like any product, it’s not for everyone. Experienced players will find little of value in the set. However, if you or someone you know wants to dip their toe onto the vast and turbulent D&D swimming pool, this is the set you’ll want.